Now it is nearing the end of the season here in Governors Harbour, this week I am giving a quick roundup of what’s happening. Well the weather is still very hot and we are all hoping that a lot of rain may come our way but we will see. There are still visitors here on the island – but it is definitely winding down. The swimming pool at the Yellow House has been doing a perfect impersonation of the diving pool at the Rio Olympics ! It is green – it has ranged from pale green through to a rather revolting deeper shade as well ! I have read up on how and why it happens and understand it now – but trying to get it back is not a simple process. But you will not be seeing any pictures of it just yet. The Rainbow Inn has already closed down for a couple of months. Tippy’s closes on September 5th along with 1648 at French Leave. Last year we were lucky and 1648 stayed open all through the quiet season – but this year 8 of the staff are going off to the US for training with the Marriott Autograph group. When they re-open in either late October or early November they will be a branded Marriott Autograph property. So expect a few changes – I’m sure it will be an improvement on an already popular spot…. Tippy’s re-opens around 25th October and 1648 at about the same time. 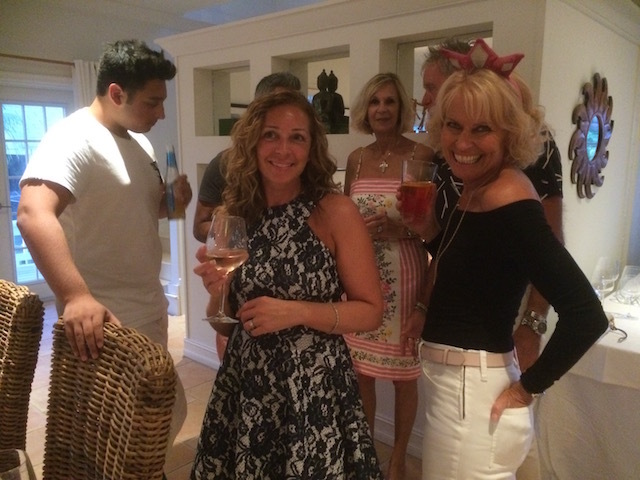 Party party- don’t you love my special party headgear – thanks to Dan and Larry for that ! Last week was my birthday and instead of going out for a meal I decided that we would have a small party instead. 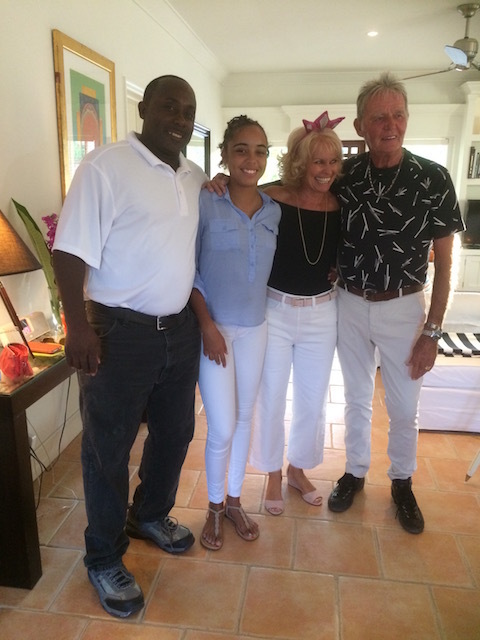 Dear Stephanie Mariscal did the catering – we had just bought a new grill for the Yellow House and so that’s where we held the party….. We ate delicious grilled chicken, grouper and lobster tails along with some lovely grilled vegetables. I had been to lunch at 1648 and shared a really good molten chocolate cake with my Mum and sister Jane – and was then delighted to receive a gift of a birthday cake to go with the two deserts that Stephanie had made! Plenty to be distributed around the next day in proper Bahamian style. Oh – don’t mind if I do ! 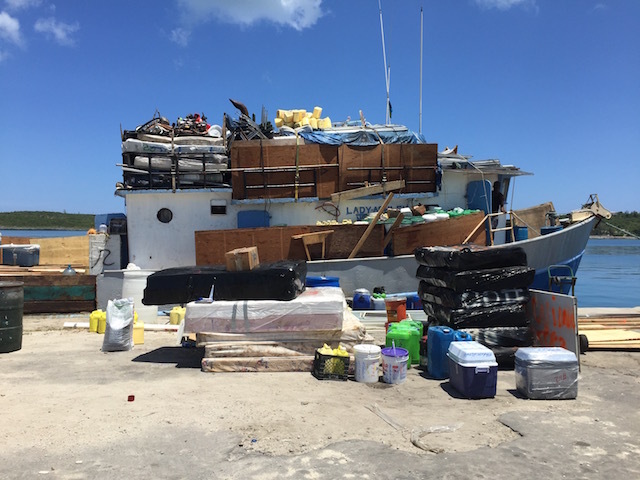 – thank you 1648…..
On Sunday we drove out on Cupid’s Cay and saw a heavily laden boat about to set sail for Haiti – first time I have ever seen this but I understand that it does this trip regularly – talk about everything but the kitchen sink ! Afterwards we had a last lunch at Tippy’s with Jane before she caught the plane back to London – always a sad and tearful time – every year !! Anyway – she will be back next year I know…..
Last lunch before Jane left…. The houses at the old Duck Inn site are coming along well – windows should be arriving very soon and the beautiful wooden floors will start to go down once they are in. The new very modern house also on the same site has risen up and is really taking shape. Still dreaming about bringing Rudge home – at least another week has passed – getting closer…..
Lovely to hear from you as always….. 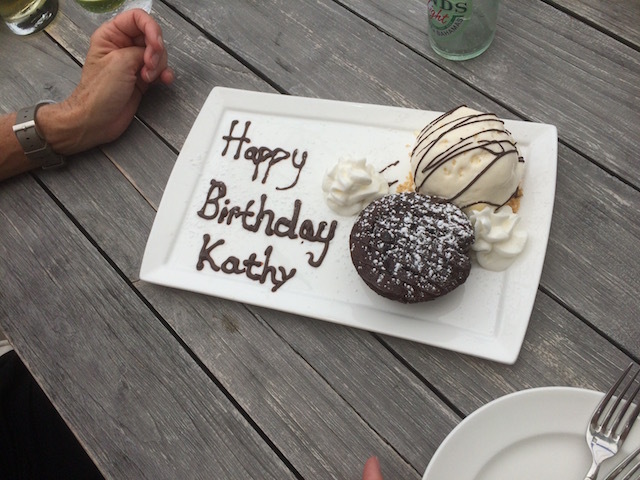 Thanks for all the news from G .H., a belated HAPPY BIRTHDAY Kathy! wish we were there to share the fun with you , you all look wonderfully , healthy and happy! We hope to return next year to your share little peace of paradise with you . Still a couple more weeks until we get him – cannot wait ! Thanks Mary, yes Naomi is becoming a real beauty – and such a lovely girl as well….. So nice as always to hear from you. 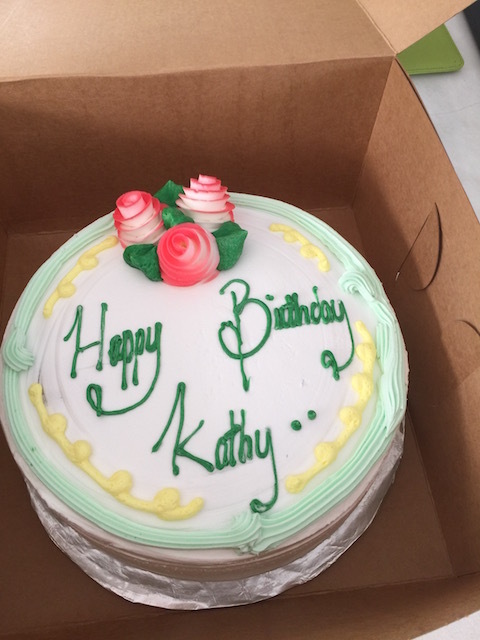 Kathy, a late HAPPY BIRTHDAY Your blogs are terrific. 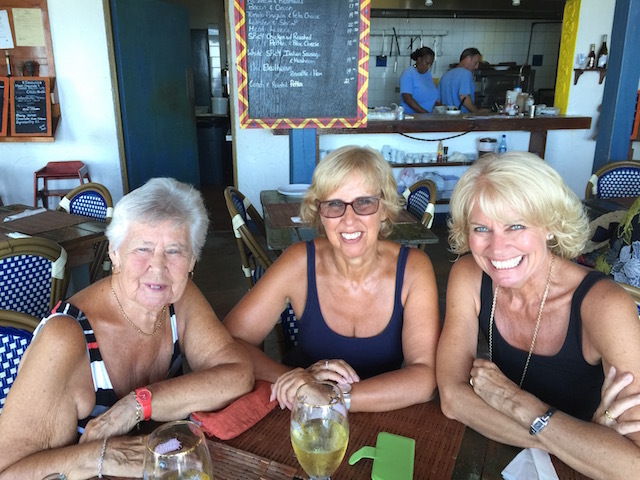 They keep Judy and me in the loop and makes us feel, even more, a part of life on Eleuthera. Such a wonderful island. Glad you liked the Crosby, now on to 1 Hotel. Say hello to Angelica for us and make sure she loads up on the Tates. Looking forward to February and meeting Rudge. I don’t know how come I hadn’t replied to this – so sorry ! Kindest regards to you both and Rudge is now here with us at home. he is a gem !